If you think there's no condo bubble in Toronto - or that it's not so bad, think again. As of November 1, 2013, the city of Toronto has a total of 4,449 floors under construction, which is more than the combined total for New York City, Mexico City and Vancouver, which are ranked 2nd, 3rd, and 4th in terms of buildings under construction in North America. 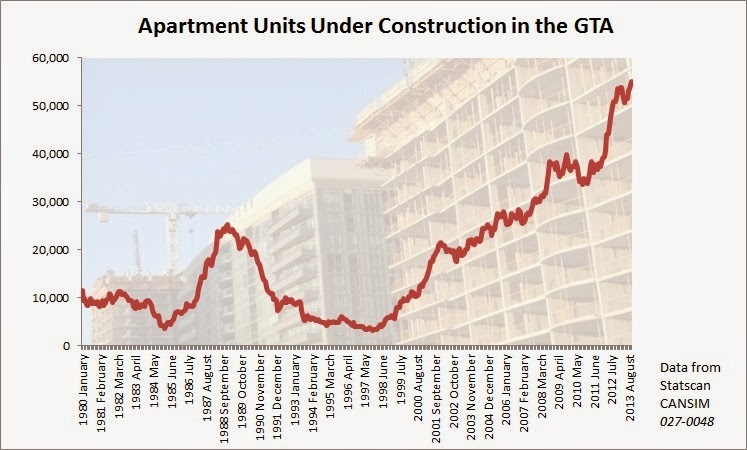 The fact of the matter is that in September 2013, there were 67, 915 residential units under construction in the Toronto CMA. Two thirds of them (45,672) were in the City of Toronto. Almost all of them were condo units. 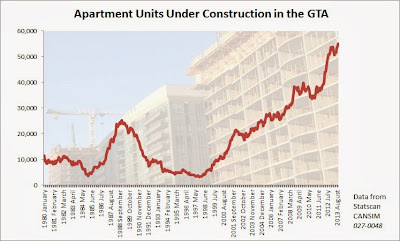 Currently there are more apartment units under construction in the GTA than ever before. Ten years ago, the City of Toronto accounted for 25% of regional housing starts. Today that number is 45%. But how sustainable is this level of construction? Is this amount of construction justified by the demographics? If so, then how come anywhere between 50% to 70% of units were sold to investors? In other news, Glass falls from Shangri-la yet again!